Much has happened since the expedition to Eden. Increased seismic and volcanic activity has forced us to relocate our colony again. We must build up our colony and expand our research to take care of our people. Our scientists have also analyzed the data we acquired in Eden. The news is grim. A micro-organism that may have been part of Eden's terraforming experiments has spread throughout the region and destroyed the colony. After the resistance we encountered, some of our leaders speculate that the microbe may have been intended as a biological warfare weapon. Regardless of the original intent we do know this: the microbe is lethal to humans. It seems to be bio-engineered to break organic compounds down into their base elements. Some of our brave scientists have already fallen victim to it. We have been able to modify your computer display to show a simulated growth pattern for the microbe. Be watchful for any sign of it. At this point we know of no way to prevent its growth. 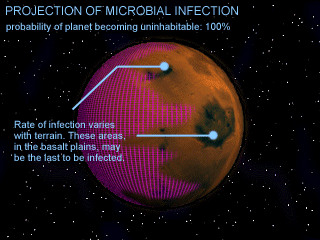 It is possible that the microbe may continue to consume the entire planet. Some of our scientists have suggested we make plans to begin construction of a new starship and evacuate the planet. Our Council has agreed to a more moderate course of action. We will allocate some resources to research certain topics our scientists suggest, such as the potential uses for the Rare Ores we have found in this area. A robotics specialist has proposed an unusual project for research that he calls “Spiders.” We should pursue this topic as well. One more piece of information recovered from Eden will affect our plans. Records show that some people and vehicles escaped the destruction. Eden, in some form, is still alive. We fear some of the people who caused this massive destruction may still be somewhere on New Terra. We must take precautions and protect ourselves. Several proposals for new weapons systems have been submitted. The electromagnetic pulse (EMP) weapon looks especially promising. Computer projections have generated the Specific Objectives list of things we need to accomplish to continue to grow our colony. Keep at least 45 children alive. Keep at least 32 workers alive. Keep at least 18 scientists alive. Completely research Advanced Combat Chassis. Have 4000 units of Common Metals in Cargo Trucks.